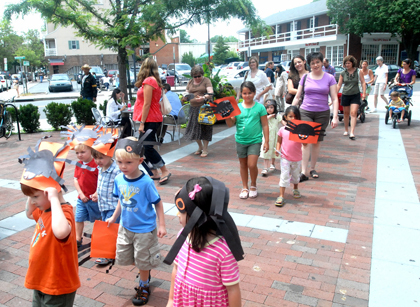 A BUG PARADE ON THE PLAZA: After making their own bug headwear Monday afternoon, Princeton preschoolers paraded around the third floor of the library and then continued the march on Hinds Plaza. The Princeton Township Committee unanimously approved the Townships 2008 budget at its Monday evening meeting. Developer Jack Morrison, contractor Michael Lee, and Borough staff attempted to allay merchants fears regarding Phase II of downtown redevelopment last Wednesday, laying out the projected timeline of the construction of Building C, which will be built on the site of the Tulane Street parking lot. KSS Architects recently released report on possible outcomes for the Valley Road building was the main focus of attention at the Monday afternoon meeting of the Townships Historic Preservation Commission (HPC). Of particular concern was the reports contention that refurbishing the existing building would cost between 22 and 24 million dollars. Jana Purkis-Brash, who was appointed Senior Pastor of the United Methodist Church on July 1, is the first woman to occupy that position in the history of the church in Princeton. It is a rare lazy afternoon for minor league baseball star Will Venable. The upcoming Summer Olympics in Beijing have presented athletes with an opportunity to reach beyond their sporting achievements into the worlds political arena. It didnt take long for Matt Hughes to make an impression when he joined the University of Michigan crew program in 2000. There is an air of excitement this summer at the Hamilton Murray Theater on the Princeton University campus. It’s the kind of excitement that pervades a theater when what’s happening on stage is happening with the full commitment, energy, intelligence, and imagination of all involved. How times have changed; if a virtual stranger walked up to you professing eternal love, you would at a minimum consider calling the authorities, if not canceling that online dating subscription. However, such is the stuff of 19th century opera, and Italian composer Giuseppe Verdi was among the best of his time in providing audiences with musical drama that pulled at the public heartstrings. Dining at Antimos Italian Kitchen, Trattoria & Pizzeria is like going to to a good friends house for dinner. A warm, friendly and down-to-earth atmosphere is a perfect complement to the authentic, home-cooked Italian cuisine, which is prepared just for you. Located in the Hopewell Village Square, 52 East Broad Street in Hopewell, Antimos was formerly the site of Sansone Brothers Restaurant. Local farmers markets are popping up like flowers in spring. With increasing consumer interest in healthy organic foods, sustainable farms and agriculture, and now worry over high energy costs, buying local is the way to go.